What's red and white checkered and found all over the Ludington area? The Lakeshore Menu Guide! It is one of the most popular publications in our area for both locals and tourists, because everyone loves food and wants to know the best places to eat. If you own a restaurant, deli, or other specialty food establishment, contact Advantage Marketing & Publications to find out how to include your business in the next Lakeshore Menu Guide. 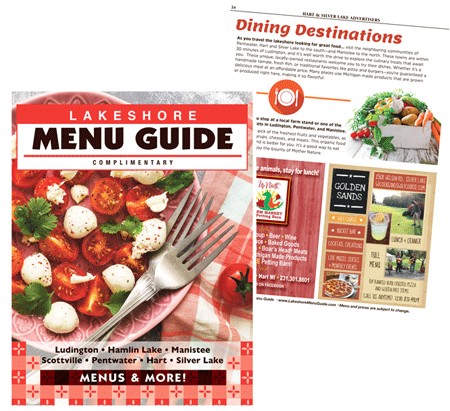 Everyone recognizes the familiar red & white checkered cover of the Lakeshore Menu Guide. It's just as popular with locals as with tourists, because everyone enjoys a good meal. Annually, 20,000-25,000 Menu Guides are distributed free to over 100 area locations. Click here for advertising information.